Only out of UNITY comes infinite diversity and abundance. Everything is connected by the vibrational energy of Creation. Everything comes from the same source of creation. Some call it the Creator, some call it God, others call it the Source or the Great Spirit, and some call it Creation itself. There can be no separation from the creator because we all vibrate with the energy of creation. There is only the illusion of separation from Source. There are many creation stories handed down by ancient civilisations, and yet most of them have one thing in common – SOUND and RESONANCE. The torroidal or torus shape is the primordial shape of sound and magnetic fields as they give rise to physical form. In my presentations and workshops I show how it is always the sound/voice/word of the creator that brings forth everything in creation – seen and unseen, and how everything has its own Prime Resonance Frequency. Once we comprehend this, it becomes very easy to explain everything in creation - around us and within us - including matter, disease and the illusion of separation. The religions of the world were created as a platform for division and separation, giving people the belief that they are special or chosen. But we all come from the same Source Creation – we are all infinite fractals of the Creator – with all the knowledge of creation within us. No one is better or more special or different. But, just like the trillions of cells in our bodies that all come from the same original cell, we become unique individuals with special and unique talents and skills. Each cell plays a critical part in keeping the body or creation alive – working together in unity – cooperating in harmonic coherence with the cells around them. Even when the cells gang up in specialised clusters of cells like the liver cells, or heart cells, or brain cells, or skin cells, they do not compete with, or overpower the other cells in the body. Any dissonant behaviour by individual cells, creates a situation of dis-ease, or dis-harmony, and brings the body of creation under stress. But nothing can override the primordial resonance of Creation. And so, in a healthy body, the dissonant cell is normally overcome, or corrected by the healthy resonance around it, or the dissonant cell simply dies, leaving the body healthy and vibrant (vibrating at optimum frequency of creation). But in a body under stress, one single cell of dis-ease or dissonance can infect the whole body of cells by a frequency of incoherence, that often leads to the demise of the main body. One of the primary objectives of the UBUNTU Liberation Movement is to share this knowledge with the people of the world. Only through UNITY can we achieve infinite diversity and abundance. So let us see our communities as extensions of our bodies, and the world as our community. Billions of cells that keep our world alive and vibrating with the prime resonance of creation. Each one of us contributing our special skills to the well-being of the entire community of cells – our world. Now – take a look around you – feel the resonance of creation vibrating through everything you see – feel how everything is connected – and how you are connected to everything. Feel the resonance of creation with every beat of your heart – and then ask yourself the question – WHAT MAKES YOUR HEART BEAT? Once you get past the nonsensical childlike explanations of conventional mainstream medical books, you will reach a moment of realization that the resonance of creation, and the breath of the Creator pulses through your body, with every beat of your heart. Everything is connected – and you are connected to everything. 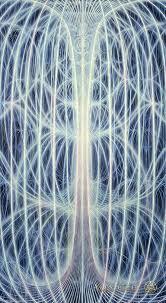 Thank you Alex Grey for the wonderful illustration of the Universal mind - From the Chapel of Sacred Mirrors.